Geografi: Afrika er et Kontinent syd for Europa og sydvest for Arabien med kystlinjer til Atlanterhavet, Middelhavet, Suezkanalen, Det røde hav, Det indiske ovean og Sydhavet. 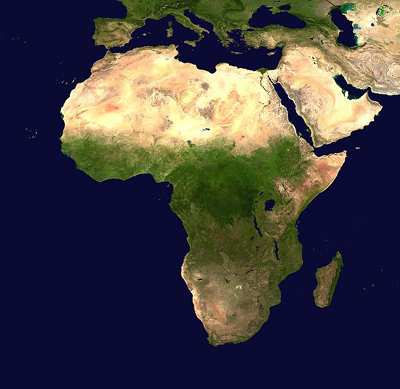 Africa is an Continent south of Europe and southwest of Arabia with coastlines to the Atlantic Ocean, the Mediterranean Sea, the Suez Canal, the Red Sea, the Indian Ovean and the Southern Ocean. Romeriget / the Roman Empire. Katakomber. General History of Africa. / : UNESCO International Scientific Committee for the Drafting of a Ceneral History of Africa. Volume I Methodology and African Prehistory (Editor J. Ki-Zerbo), 1981. A guide to original sources for precolonial western Africa published in European languages: for the most part in book form. African Studies Program, University of Wisconsin--Madison, 1994. Se også:The Africa Grantmakers' Affinity Group. Oral Literature in Africa. / : Ruth Finnegan. 'Ruth Finnegan’s Oral Literature in Africa was first published in 1970, and since then has been widely praised as one of the most important books in its field. Based on years of fieldwork, the study traces the history of storytelling across the continent of Africa. This revised edition makes Finnegan’s ground-breaking research available to the next generation of scholars. It includes a new introduction, additional images and an updated bibliography, as well as its original chapters on poetry, prose, "drum language” and drama, and an overview of the social, linguistic and historical background of oral literature in Africa'. Musik: UNESCO Collection of Traditional Music of the World. African music on LP: An annotated discography / Alan P Merriam. The Trans Sahara Counter Terrorism Partnership: Building Partner Capacity to Counter Terrorism and Violent Extremism. / : Lesley Anne Warner. Center for Complex Operations, National Defense University, 2014.
International Institute for Democracy and Electoral Assistance, 2007. Leder: Afrikas diktatorer bør tagee sig i agt [for ICC]. I: Information, 21. juli 2015. CRS: Africa: U.S. Foreign Assistance Issues. / : Ted Dagne, 2011. Se også: Aktuelle stater ; Den afrikanske union ; The Caribbean Forum of African, Caribbean and Pacific States / Gruppen af stater i Afrika, Vestindien og Stillehavet (AVS-landene) ; ECOWAS ; Traktaten om Afrika som atomvåbenfri zone / the Treaty of Pelindaba ; Østafrika ; Det Østafrikanske Fællesskab . Se tillige: Amnesty Internationals årsrapport 2010.